“Juliette,” he says, but he’s not looking at me; he’s looking at all of me. His eyes are searching my body as if to ensure I’m still intact, arms and legs and everything in between. It’s only when he finds my face that he meets my gaze; I step into a sea of blue in his eyes, dive right in and drown. I feel like someone’s punched a fist into my lungs and snatched up all my oxygen." Imagine that repeated over and over, combined with a bunch of nonsensical, over-the-top and unnecessary angst for four hundred pages or so, and you get a feel of the book. If you thought The Selection was too heavy on the romance, boy, you are in for a treat. 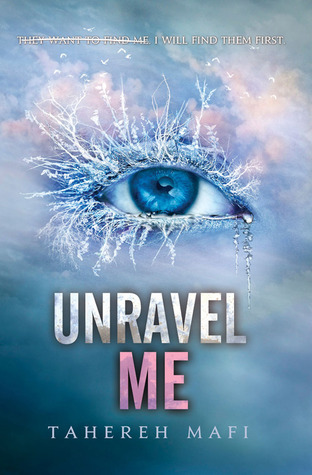 Now, I know I’m sounding a little harsh here, but Unravel Me was a disappointment compared to Shatter Me. Sure, the first book was a bit sketchy on the world building and plot, but it made sense. It was told from Juliette’s perspective after having being captive for over a year, everything was new and scary. Her mental state was particularly fragile which was conveyed by the writing style perfectly, and I was looking forward to seeing what happened with all of the characters in this second instalment. I was hoping we would get to see a healthier Juliette, more attune with who she was and learning to embrace her powers, I wanted to see more about The Resistance and their plans, their history. The world was something that we lacked in Shatter Me, but now with Juliette out I was sure we would see more of it. There was none of that, there was none of anything, really. 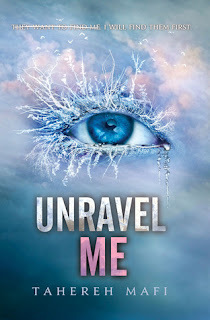 If anything, Unravel Me was one entire book dedicated to cement this love triangle between Juliette, Adam and Warner, with a little action in the end to keep us hooked until the last book. What can I say of a book without a plot? Without development? Well, Kenji was nice. I liked that there was someone out there who didn’t fall at Juliette’s feet and worshipped the very ground she stepped on. He told her she had to grow up, to put the boy drama away because they were fighting a freaking war! I just wished she had listened. During the entire book, all we have from our MC is angst, and drama, and horniness, and more angst. I’m fine with all of that, after all she’s only seventeen, but this was so much that it saturated my senses and left me numb, until I eventually got to hate it. I didn’t care how perfect Adam’s lips were, or how the sun shone like eggs or whatever for his smile, I wanted a freaking story. I was so disappointed, because Juliette had so much potential! She was free, with people like her where she could be more comfortable with and finally begin to accept herself, instead all we got was how a terrible monster she was and how she didn’t deserve Adam but she wanted him… Oh wait, just like in book one. It bothered me that she was so… mellow. Even when she was supposed to be all “kickass” and whatnot, she always got paralyzed or ended up begging, when she had the upper hand! God, is this how she’s going to be? A cartoon who can’t think for herself? Warner… well, I know everybody loves him, and I did during the first book but here… he’s just so dull. Gone is the complex character we got to know and was replaced by a poor brooding nineteen year old with daddy issues. Warner used to be so smart and cunning, it was terrifying and exhilarating, now he’s plain dumb. I want the original back! Damn it! Overall… I guess if you are team Warner you’ll love it, if you are looking for a story… emmm…. Probably not.